We supply and sell a comprehensive selection of VDO TPMS sensors for use as new or replacement parts. Our customers typically include consumers or trade customers who need to replace broken or faulty VDO TPMS sensors for clients. Through our extensive supply chain we are able to supply genuine replacement VDO sensors for your vehicle at the most competitive prices – whether you are a consumer, garage or tyre fitting centre. VDO manufacture some of the most popular tyre pressure monitoring sensors on the market -designing and developing TPMS sensors as Original Equipment (OE) and for retail. As OE suppliers VDO work with popular car manufacturers like Citroen, Peugeot, Renault and Ford to produce sensors that are used during the production and manufacturer of their vehicles. In order to become OE suppliers VDO have to comply with some of the most stringent engineering and quality standards, and gaining this status with so many brands is a testament to VDO's engineering capabilities - especially in the world of tyre pressure monitoring. Formed in 1929 by Adolf Schindling VDO is now part of the well-known tyre company Continental AG, having previously been known as Siemens VDO Automotive Group. VDO was originally formed by the merger of two companies that specialised in the manufacture of speedometers for motor vehicles, rather than tpms sensors. Throughout its history VDO has been through a number of significant mergers and acquisitions dating from as far back as 1978, and it has at times been part of Philips, Vodafone and Siemens. As a business unit of Continental AG, VDO produces a wide spectrum of products, both on an OE and retail basis, for the automotive industry. This includes tyre pressure sensors, instrumentation, cockpit solutions, parts for braking systems, and diagnostic sensors and systems. Siemens VDO tyre pressure sensors were first fitted to Fiat Ulysee and Lancia Phedra vehicles. Now, as a business unit of Continental, VDO continue to manufacture a wide variety of sensors for many different manufacturers. 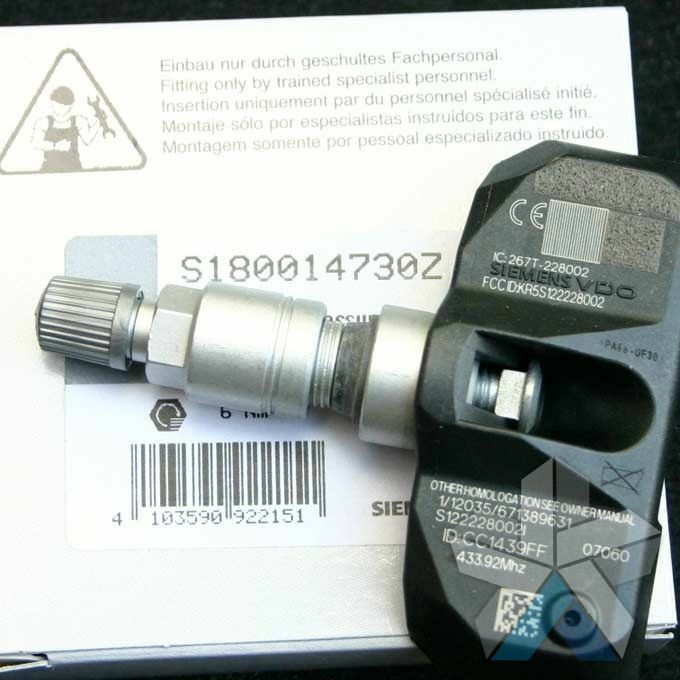 This includes replacement VDO sensors for vehicles fitted with original Siemens-VDO TPMS. Replacement sensors are now simply branded 'VDO'. We have listed a number of VDO sensors below, however we are able to supply many more. If you can't see the sensor you're looking for please contact us. We can arrange to supply and sell individual VDO tyre sensors or complete sets. Additionally, if you are unsure which VDO TPMS sensors you have on you vehicle our technical team will help you identify and ship replacements direct to your door. Activation: VDO TPMS sensors can be supplied in one of either two modes. VDO tyre pressure sensors supplied in TEST mode are activated once driving commences and the vehicle learns the new sensor codes. It does this by sensing movement from an internal accelerometer. VDO TPM sensors that are supplied in SHIP mode require a special tool to provide the 125kHz signal required for activation. All VDO TPMS Sensors should be fitted by a suitably trained and competent technician, using the appropriate tools to ensure correct installation and safety.